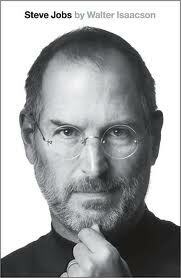 Steve Jobs by Walter Isaacson is an elegantly crafted story and one that will forever remain among my favorites. Most of us have never met Steve Jobs face-to-face and yet I think we all feel we know him on a personal level having been seduced by his products at some point in our lives for one reason or another. My memories, while not of him, are of Apple, which may be as close to him as we could get anyway. They begin when I took a computer class in high school with my best friend. The main reasons we took it were the teacher was likable and the hottest girl in school happened to be taking it too. The by-product of this hour long oasis was learning the features of the Macintosh which were intuitive and then utilizing them to compose documents such as "Why Michael Jordan Is the Greatest Athlete on Earth."